Shopping deals and hometown love are in the bag. 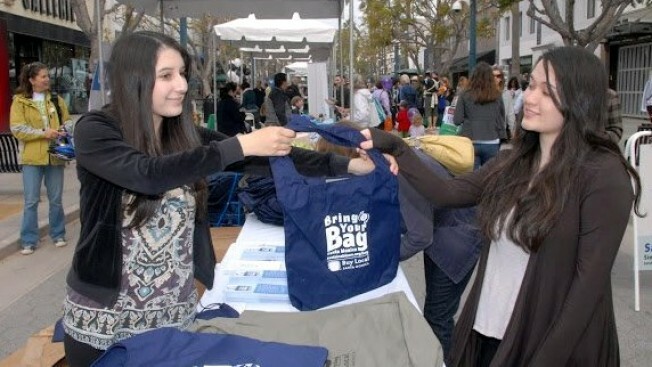 The Santa Monica Buy Local Expo is on Saturday, March 31. We're sort of inclined here to say that the idea of "buy local" has gone from an idea to a movement to a way of life, but someone might check us and say the cause is far from won. Yes, many of us make sure we stop at our favorite fruit stand and buy our berries from Mike the farmer, but its an effort many more people can be making. Santa Monica, among all cities, here and everywhere, and certainly spearheaded the local cause, and does so each year in a big way via its Buy Local Expo. The next one is on Saturday, March 31. Loads of tables'll line the Third Street Promenade and still more people will be behind those tables talking about their products and what they do and asking your name and getting acquainted. How many SM merchants -- if we typed that SMerchants, would anyone mind? Okay, thanks -- are set to show? Over 80. Entertainment and other day-out to-dos will be happening along the Promenade. And the bonus? Sidewalk sales'll be going down all over the city, so scoot over to Montana and Main and Ocean Park before or after your Expo visit. In fact, let's go there: March 31 is all about good stuff happening in shops owned or run or managed by people who live in Santa Monica, or at least LA. If you like that idea, get out and show you like it.